This FZ showed 23,000 kms. in his speedometer. The appearance of the motor screws, the inside of the bike, the presence of original tools, the technical inspection document with the kms. stamped on, all corroborated that so few kms. were real. Every vehicle buy used, even with few miles in the odometer, should be thoroughly revised and revamped. I am particularly a freak with the maintenance of my bikes: as I demand the 100% from them, I mime at 100%, and that means from weekly checks tire pressure to scrupulously comply with the full specifications of the manufacturer's maintenance manual, including swingarm and suspension links greased, i.e., that almost nobody perform here in Spain. This FZ looked near new and this was the case regarding paint, cowls, hardware and general appearance ... but a careful inspection revealed a small fuel leak and when started the engine was not sound, vibrating and running in 3 cylinders until working temperature was reached. And the little things that always emerge when you buy second-hand: a new fuel petcock, several screws, some gasket renewed, new brake pads ... that really count because you always have to increase your budget, like with a new good quality transmission kit despite of having few miles, because the lack of use and maintenance destroy the chain. And a pair new tyres, of course. Things must be used. Otherwise, self-destruct: the carburettors were internally knackered, corroded by old evaporated fuel. And some bungling "mechanical" instead of checking and adjusting valves tried to adjust the carburetion to compensate 16 footprints valves ... as always, finding odd jobs crimps and carried out by alleged professionals in Spain. This FZ is strictly original, even with the OE stickers everywhere and the ugly long original rear mudguard untouched. Elements like the rear cover cowl, the leather seat stripe and the OE toolkit are present and immaculate, like a time capsule. Note that in the OE toolkit is included a big ratchet necessary to adjust the rear suspension quite easily. - K&N air filter in order to get better performance. I like a lot the miracles that performs these filters, improving mid throttle power, just where it is needed. 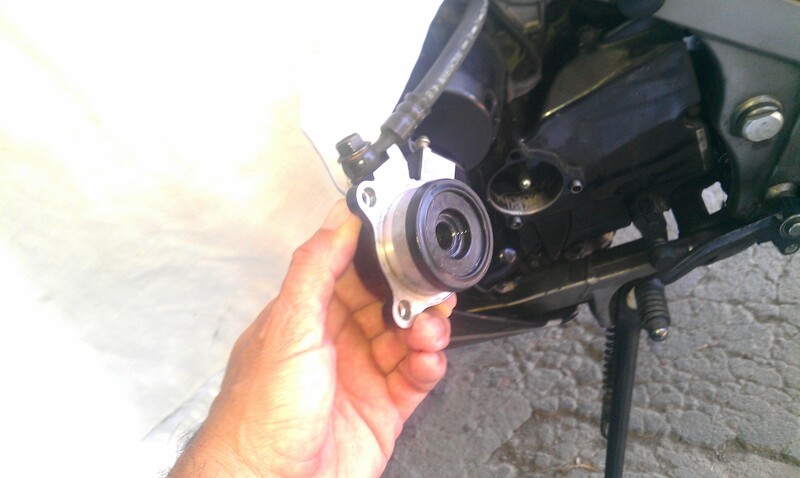 - HRC fuel cap trick (take a look at the CBX 750 mods section of the website). - New metallic brake hoses and front callipers and master cylinder from a 2009 Yamaha R6. - Metzeler MZ8 radial tyres, truly decisive improving the handling, in rear original size, but 110/70/17 front size instead of the OE fitted 120/70/17. The OE front rim is 3" only, and the modern 120 tyres are designed for a 3,5" rim with a stronger carcass less suitable to use and oversized tyre on the rim. And you get more weight at the front wheel lowering the front nose. With an OE 120 is possible you have to raise the bars over the yoke between 0,5 to 1 cm to get so perfect (and modern) front feeling. 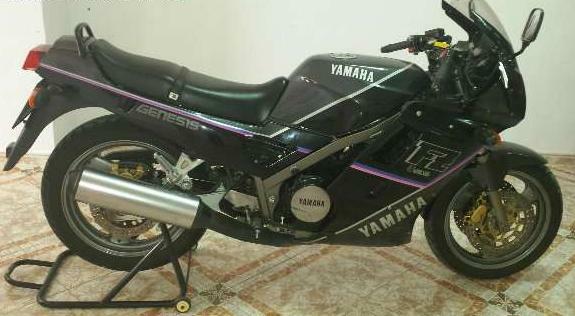 We had serious discussions about if fitting Yamaha FZR 1000 87-88 Genesis 3,5" front & 4,5"x18 rear rims. These make suitable the use of 120 front size with 160/60/18 rear, with 2 mm. difference at the rear only over the OE size, almost identical. Fitting an 5,5x17 EXUP rear rim to fit 170/60/17 or 180/55/17 I think lower the rear end, taking to a further find of a correct shorter dogbones again or, very expensive, buying a longer rear shock. 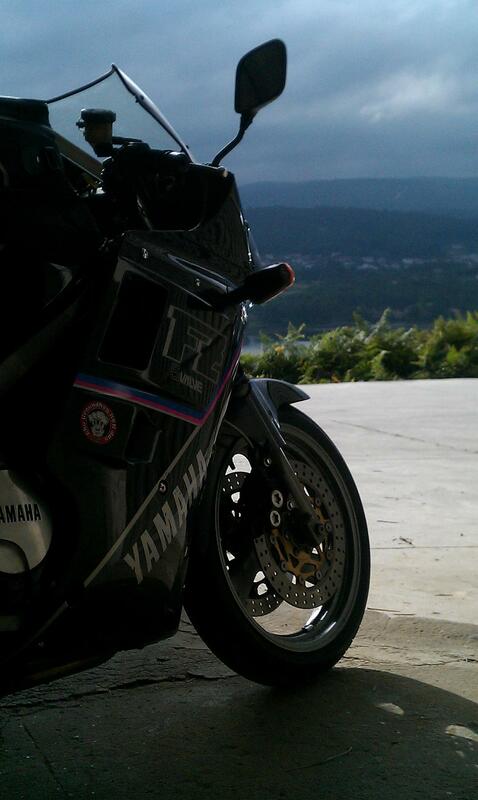 But at the end I chose to leave the OE rims (in perfect shape) in order to test the bike with only subtle mods. The most obvious difference is the from rim, from 16 to 17", and the front brakes. Like I've repeated in my website and tested in different Yamaha models range, those gold callipers are very bad, prone to rust and even changing the master cylinder these have a wood feeling, hard but without brake power. It would have been better maintaining the old callipers with a capable new master that offer a fantastic power even in a bulkier FJ1200. I like 80-90s motorbikes, but not that era brakes. So I fitted a complete front brake system from a 2009 Yamaha R6, that fit straight on, only making specific metallic hoses. I don't like at all the feeling of this master anyway, but more of this later. The rear rim is a bit wider than on the previous model to fit comfortably a 140/70/18 size instead of the old 130/80/18. Not too much than before and lowering the rear end. So we fitted a shorter dogbones from a FJ1200 3XW, that fit straight on too. We could have changed the central tie rod to the OE inner central optional fitting point (PIC). And we could play with different dogbones from a Yamaha FJ1200 3CV, but the first attempt was the good one, fortunately. Anyway is good to know that you can adapt the bike to your riding and style preferences. The bikes of that era improve no end with a geometry change to take advantage of the modern tyres, real motorcycle key evolution. In many cases, a eighties - nineties motorbike with a light geometry adjustment, and modern tyres and brakes mean we own a superbike elevated to a modern level of stability and handling. Mid-July in Madrid. 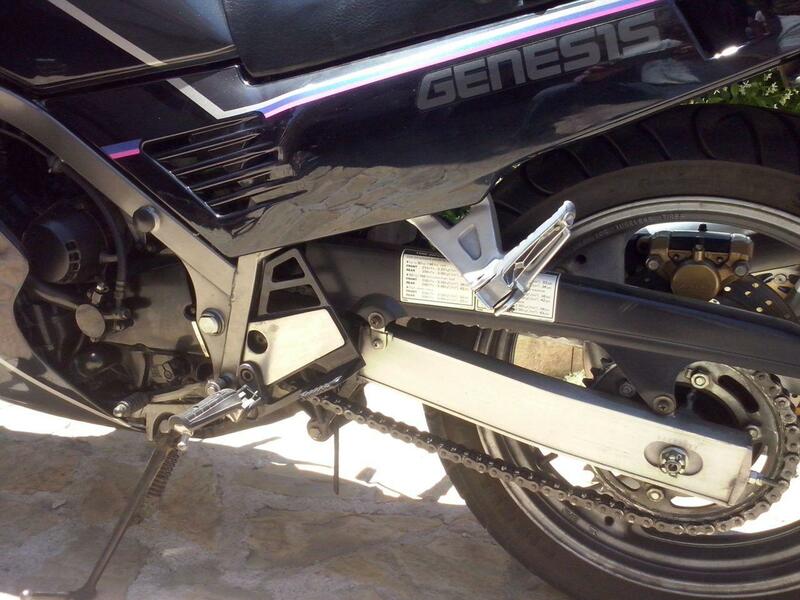 Hot day but perfect to make the first road test of the bike and perform a suspension adjustment early in the morning. Joining me 3 friends with 3 subtle tuned FJs than may look like very similar, but their different mods do each bike unique and completely different of each other, an excellent opportunity to ride each bike in order to comparative mismatches and virtues with my FZ . Its very important changing the bike when you try to make suspension adjustments in order to reset yourself and feel better the way that you choose when varying suspension set-ups. We go to a stretch road well know by all of us, 30 kms. round, with worn tarmac, straight and winding sections and closed sections where you ride very fast, in addition to the virtue of the road both uphill acceleration and downhill braking so that you can test the bike behaviour under very hard braking. Furthermore, the road factor, well known, is removed from the equation. First surprise and first difference from previous models: the handlebar is more open at the ends, which makes the bike ergonomics much more natural and with much better lever arm to control the bike in all circumstances. If I were the owner of any previous model, I would fit these semi-handlebars latest version because it is a very very important for driving and, like a bonus, the aesthetic of the bike does not change for the sake of originality. Having lifted the bike back is crucial: the original have an old rear-end sitting posture with almost stretched arms at the front. Awkward, especially since you can not change your body positions on a long trip just to relax because you are sit in the bike and that do not allow you change weights on the bike when driving. Changing rods and the more open handlebars let you to adopt a more natural posture, half upright without backaches and perfect to have full control of the bike in sporty riding mode. I give testimony that even in 800 kms. in 8 hours ride on secondary roads I noticed a slight pain on the back. With zero vibrations, soft feeling and low, medium and high rpm. power the engine is simply PERFECT!. A lot of much modern fuel injected engines are put in evidence, strangled by the EU emission rules, that literally feel like a bronco bull at low rpm, with no power at medium rpm and only working at 10.000 rpm. and above. 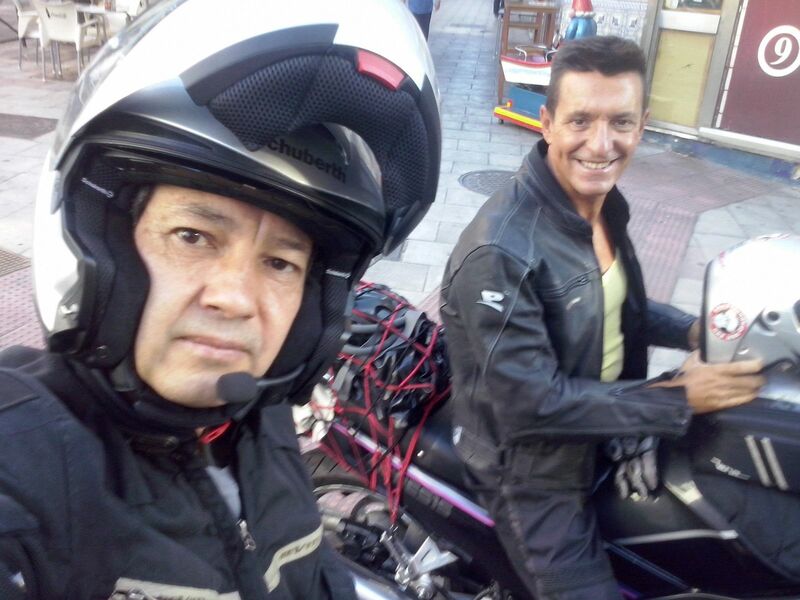 You can ride on urban zones at 40 km/h in 4º gear, long travels without to get more than 7.000 rpm. with less than 6 litres/100 kms. (170 km/h in 6th, enough to get you on jail and in curves you have to be an experience rider to go at this rhythm) or switch on your mode "warp speed, Mr. Sulu" and higher the engine to 11.000 rpm. (more than 240 km/h showing at the odo), not too much safe on open roads and in fact demanding a lever of control riding a bike that not too much people met, except on motorways, with a perfect stability that don't deserve any merit for riding at that speed. Driving the marvellous engine without passing the 8.000 rpm. mark you can ride with modern RR bikes on tight roads, with absolutely safety, playing between 3er and 4º gear (because in 90º bends the engine pulls ahead from 2.500 rpm. in 3rd) and, better of all, overtake the boys with their "Manga" aesthetics bikes. The gear change is soft and precise (maybe a careful rear wheel alignment?) and the typical Yamaha CLONCK is low and only when 1st is engaged... nothing like the horrible noise in a Honda, but not so silent like in a Suzuki. The hydraulic clutch is soft and precise, with perfect feeling, and the dashboard needle only go near the middle of the temperature range when in the traffic and in the middle of summer (the excellent new and expensive coolant give back profits). Riding until the red line in race mode not get the needle showing a little more over the minimum. I repeat: a gem of engine. In addition, the little fairing and the admission sound you feel that you ride much faster as you in fact go, making a very funny bike. Oil consumption is NULL. Yes, I know that the 20 valve Yamaha engine are notorious for their oil thirst. I've owned 3 of them and I've not have that problem in any of them. Maybe it is because I always properly get the engines get temperature until ride properly. I don't know. I've used a mineral 20-50w oil due to the poor previous ride of this FZ. After 12.000 kms. well ridden I will change to a semi-synt oil. In early versions the shock was a closed damper unit with remote adjustable hydraulic preload. A lot better quality and more expensive to manufacture. So except playing with geometry and fork oils, and adjust preload for my weight, little can be done ... but enough. Lifting the bike back with the shorter rods, leaving the fork on its original height in the yokes, let gain agility, eliminating the feeling of driving a long bike that you are seated on the rear, without losing stability in any way. The fork was perfect with oil in OE quantity and density, supporting the extra work of brakes without any feel of overload in any circumstance. The rear shock was found the weak point of the bike in this first test:, rough and hard with too much compression and lacking extension damper ... but further reading below. I am not going to repeat myself again about the null quality, feel and power of the original equipment. 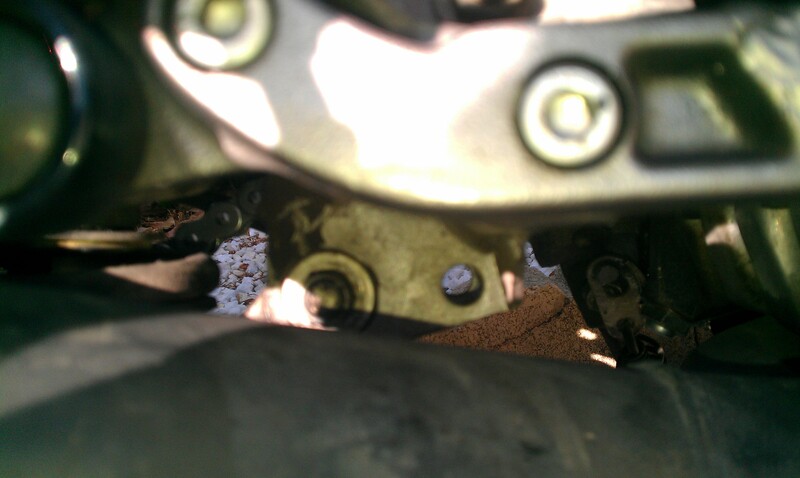 The 2008 R6 front brakes kit is a phenomenal unit and fit straight on. But it is a race equipment: perfect for lower the speed from 200-60 km / h, for example, but from 60 km/h to stop the bike the pump feel is bad and the brakes are not too good. I know it's not due to quality of the pads, the same Goldfren racing compound pads that I use in my other bikes. The overall feel of these Yamaha brake masters of the penultimate generation is not very good, no. The rear brake is perfect to steer the rear wheel, with good touch and power but without block the rear tyre, and great to go quickly performing controlled back slides. Very good indeed!. Then came the acid test: road riding and side to side with 3 real mile eater monsters. 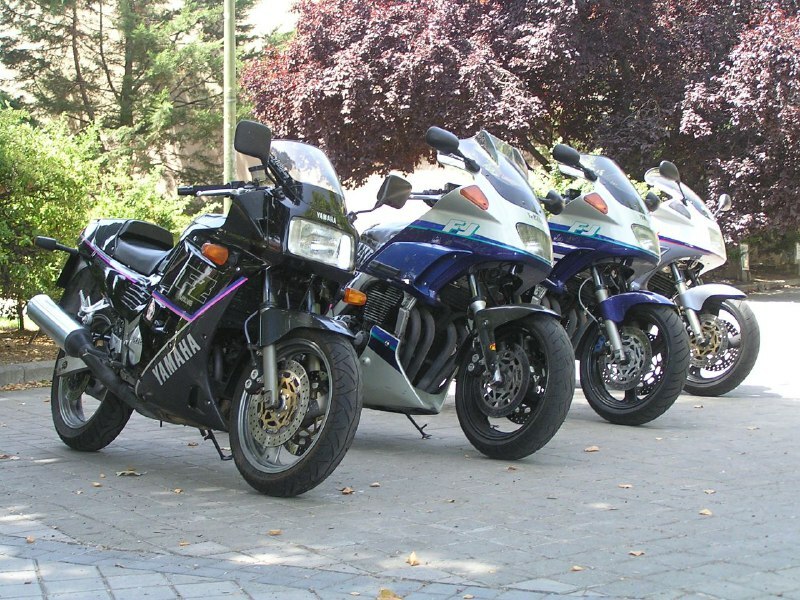 Of the 3 FJs, the one with the inverted fork from an YZF 600 really was very wrong: the owner has not been able to properly regulate the fork and new geometries. The bike didn't like to steer and you had to wrestle with the monster when in its side because it wanted to stay up and straight again. One of the worst FJs that I've tested. In his day the FZ dethroned the FJ from the races in Spain, in the twisty racetracks in our country. Is the FZ a better bike ?, would I change my FJ love for this FZ definitely?. Passing to any of the FJs from the FZ is like to get a truck: the road looks narrow and the feeling is that going much more slowly and without much room to improve ... and then you check your references on the road. And it turns out that any of the FJs were about 40 km / h faster when braking at the same points. Here we have the opposite: the armchair position, imperturbable stability, brutal engine power at low rpms. that make unnecessary to spinning the engine to high rpms. to go fast and the wide fairing conspire everything to create a false illusion of going slower than you really ride. But that day the FZ had its Achilles heel: its tires. 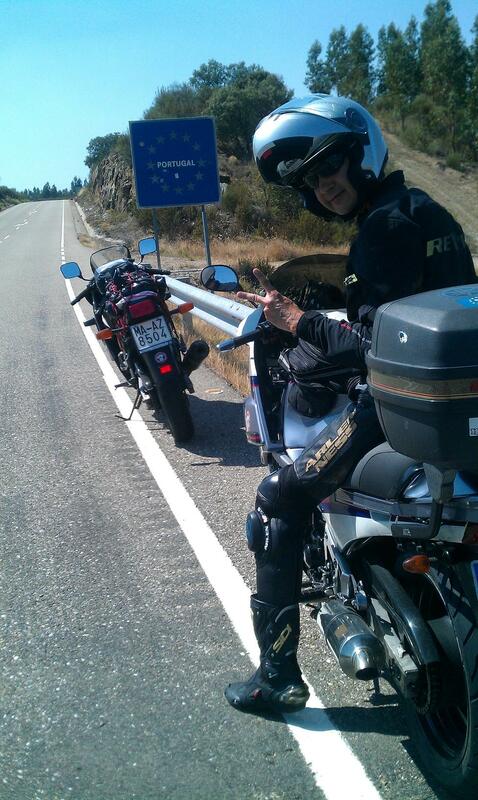 The day of the comparative test with the FJs, the FZ wore Pirelli Sport Demons diagonal tyres, with 120 in front. Aside from not give confidence under braking, the rear shock felt rough, with too soft spring, hard in compression damping and lacking in extension damping. But really it was the rear tire flexing and transmitting insecurity even on a hot July day. I will not tire of repeating that these Pirellis are junk. I've already tried other measures on older bikes because these tyres are cheap. False economy ... !. I repeat: these Pirellis ARE CRAP !. Flex, suffer from odd degradation, don't have any cold grip, slide when hot and waste quickly, passing each bump to the rider and moving side to side in each white line. A disgusting !. The Metzeler MZ8s transform the bike: the stronger radial carcass complements and helps the rear shock, feeling like you've even changed the shock for a much better quality one. But also make the bike surefooted when braking, make the bike quick to the point of being able to get the bike on its side simply with a little pressure on the footrests, maintaining perfect stability and 200 +. The sensation is like not only the suspension have been improved, but the chassis has been reinforced too. And MZ8s are mediocre compared with i.e. Dunlop Roadsmart, especially because the Metzelers behaviour begin to worsen once half worn-out. The most dangerous, and that would take me to avoid mounting anymore, is that on very hot days, with tyres at temperature, the tyres slide like on ice when you find those black asphalt lines used to fill cracks on the tarmac. In 7,000 kms. I only suffer a fright, and very big one, because of this feature. It would have been a silly side drop, but in the middle of Portugal would have meant breaking the bike and the end of my holydays trip. It makes my mouth water thinking of better tires, because the improvement achieved by mounting the MZ8s was spectacular. So fitting wide rims, easy to do, it becomes even more interesting. That's when I do enjoy. Thrashings of more than 500 kms. by secondary 2 ways roads, curves, hairpins, crossing mountain ranges in the middle of nowhere, lost roads ... discovering villages and beautiful landscapes while riding fast, and enjoying the bike more when more tight curves I have to ride on. Stopping every 250-300 kms only for fuel, drinking, cleaning out bugs and continue buzzing ahead. I don't like "gastronomic travels". I prefer to eat at the end of the day, after a shower and with the bike in a garage and ready for the next day. As an endurance race. To carry a bag at the back of the bike with a cargo net is better to disassembly the passenger grabrail (2 screws). And there is 2 purposeful grab rails under the side covers to hook the straps. Hence the seat is long enough to use the cargo bag like a bump stopper when under acceleration, much better that the original seat hump, too far away even with my 1,80. Don't miss to cover the little rear cowl with a rage to avoid scratches. My big magnetic tank bag fitted perfectly on the big and flat deposit, so I carry lots of things in my luggage without problems. The footrests are perfect situated for my height. Better even than on my FJ with shorter seat/footrest relation, more comfortable for my legs and knees, not so much bent. The more opened handlebar than in previous FZ versions let a comfortable arms semi flex position, light years away from the torture ergonomic of its descendants (FZR 1000, which required Gibbon like arms and carrying too much weight on the wrists). With the back of the bike raised the posture is rested, perfect for keeping full control on curves and at the same time very natural, without forcing the knees or elbows or wrists ... and provide ergonomics that allows changing the body position during a long trip or, as the type of road we attack, changing the body shift on the seat at the front or the back as we wish. A posture that reminded me of the magnificent one of the all versions of the great CBR 600 F.
The fairing protect from the air much more than it seems and never I feel pain in the neck to fight against the wind. The switches, selectors, pedals and handles are perfect, with good touch, with luxuries such as automatic shutdown of the indicators, the gear change is smooth running and the near electric engine can almost be kept above 4th gear on any trip without shifting down. It is elastic, accelerates through the entire band without hesitations or pauses, even faster from 7.000 rpm. until the red line ... much better than most modern injection engines that I've tested, especially low-down giving a soft touch that a few engines have. The info provided for the dashboard is enough. The fuel level is very reliable and only you just have to take into account the shape of the bottom tank which conditions its indications: with the first half deposit you cover 200 kms. and with the 2nd half, around 140 kms. Only missing is a time clock. And not for me, because then I proceed to time myself in known sections and that is not a very healthy habit in open roads. Do you miss CDI programs, electronic gadgets on a board-computer or similar trifles? No. I'm writing about riding motorcycling, not playing PlayStation games or speaking about a new whatsoever App. 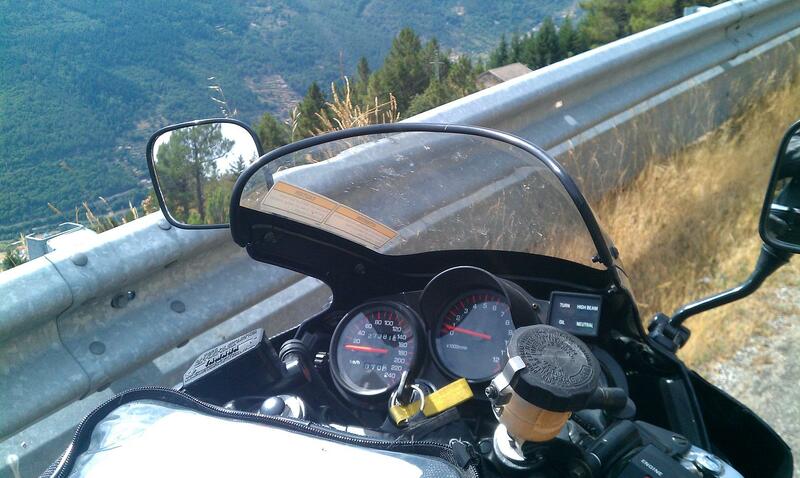 When properly riding, almost always I ride focused on the road and listening the engine with only occasional side glances at the dashboard, mainly to the temperature dial. To play with electronic nonsense is safer to do so on the sofa at home. The only black spot is the seat: hard and digs you into the inner thighs. Today it would be easy to install an inner gel support, for example, and it would greatly improve the comfort. Anyway it's just really uncomfortable after the first 200 kms. And with leather trousers the seat is much more comfortable. The range of over 300 kms. with the bike in shape and fine tuned, and not going for a walk, but on the contrary, allows point-to-point times of scandal without fatigue. On this bike you get exhausted when you ride slow. It is more tired make 200 civilized kms. than 800 at full go. Let's be clear about one thing again: the OE ergonomics, with original dogbones, is a torture. You sit with your back very low, in an unnatural position, and the handlebars are far away. The seat is even more stuck up and further there is the no possibility of changing your body position, that makes it this bike so great for long trips attacking roads. I have not carry anyone. Full stop. As you can see from the photos I took off up the passenger grabrail in order to a better support for the cargo bag. Why torture to anyone ?. The seat must be horribly uncomfortable, plus it would be necessary to increase the preload to compensate the passenger extra weight that would affect the stability and handling. Moreover without no possibility of raise the hydraulic to offset the extra preloaded spring. It is not a bike to carry anyone. There are lots of better bikes for that duty. Although the FZ is much more comfortable than any modern R.
Despite the previous overhaul done when I bought it, you can always suffer any problem in a vehicle of almost 25 years used fast and hard ... Nothing. In fact, as happens to all Japanese motorcycles, the bike feels as much powerful and smoother as harder it was used and I was adding miles on open road. Just a typical Yamaha fail was reproduced in my FZ: the slave clutch push cylinder oil seal, that started to leak and suddenly you realize that you have very little clutch and the gear change feels hard. As an FJ user, I already know this weakness and I always carry a repair kit in my travels. I repaired in ½ hour and just buying a bottle of DOT 4 brake fluid and using a screwdriver and a 8 star key for the bleeder. If the kit is not available, simply bleeding the clutch and filling after of each day of travelling you could continue your holydays with to leave the bike in a workshop. A bad installed carburettor gasket originate a small leak of fuel with which I lived a week without problems, and that was solved with a new gasket when I found it. Incidentally I overhauled all the fuel hoses. And the original left hand mirror came to me broken with the bike. Buying a replica proved to be of poor quality and over 140 km/h it was folded by the wind. A t-zip, JC idea, solved the problem. And that's all folks, nothing more. Nor a blown bulb, or a cable.. PERFECT !. And it spent not a drop of oil or refrigerant. With a fuel consumption of less than 6 l. / 100 on average, being Council Tax exempt due to its classic status make owning the FZ a very economical proposition. This bike is a gem!. Really you do not need any more at the open road, as evidenced thrashing with my friends or with groups of modern RR in such a fast and technical road as the N103 in Portugal between Bragança and Chaves, where simply tighten up the engine at just 9,000 rpm you can leave them behind without problems, driving comfortably and easily on the open road, and with an engine that always helps and allows you to concentrate on riding. Would be different in a racetrack?. Maybe.. and riding the Rossi bike sure!... if they were able to ride that beast, that's another. I dare to say simply looking around that 98% of motorcycle riders do not need anything else. What would I change ?. Focusing on travelling on it next year I have it clear: a sports rack and rims to fit Roadsmart tyres. I can not bring with me to Tenerife, more than anything because I have not more place in the garage. And selling my car with 2 small children it is not an option ... (although I have been considering it, jaja). Meanwhile it is for sale in Madrid. If I sell it, next year I'll buy another bike and write another report like this after overhauled and ride. And the FZ buyer will take perhaps the best FZ on sale in Spain, subtle modded, oiled, adjusted and ride and with the highest quality components installed.